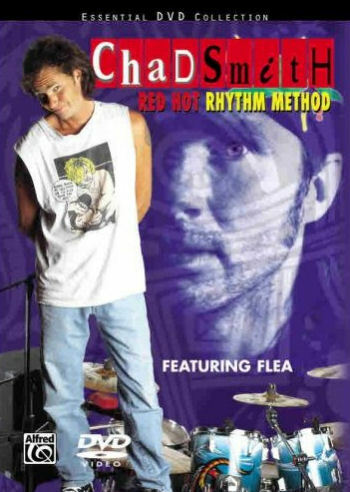 Tiger Bill's review of Chad Smith Red Hot Rhythm Method from Alfred publishing. This DVD is an expanded version of the original VHS video release. It features nine Red Hot Chili Peppers tracks remixed without drums so Chad can play along. The hype on the package says the DVD is both entertaining and educational. Let's check it out to see if it lives up to the hype. Thanks to the magic of DVD, you're given various ways to access the material on the disc. To get the maximum out of it, you'll first want to use the "Play All" function to view the complete video from start to finish. Later, you can access the "Performances" feature so you can practice along with the performances only, minus the in-between instructional material. Although there is a Subtitle option on this DVD, Japanese is the only language available. I would like to see subtitles in English for the hearing impaired added as a feature to instructional DVDs in general. After a musical opening, Chad discusses his drumkit and then explains and demonstrates the groove he will be playing on the next musical selection. Chad talks about his role as a solid groove keeper in his band and introduces Flea, the Red Hot Chili Peppers bass player. Chad and Flea then take off on an infectious, up-tempo funky bass & drum jam. More cool duo work with Chad & Flea playing off of each other like they've done it before... many times before! Cool! Chad discusses his influences growing up in Detroit, Michigan. He explains how he began drumming in school bands and was basically self-taught, and how he learned to play by copying other drummer's grooves from recordings. He also demonstrates how he came up with the groove for the Red Hot Chili Pepper tune "Breaking the Girl." Chad covers what he does before the gig as far as setting up his gear, warm-up stretches, hand warm ups, drum tuning technique, a tip for keeping track of the elusive drum key, and more. What Chad demonstrates in this section is technically NOT grace notes but left hand triplet fill-in patterns ala the kind of stuff Buddy Rich loved to play. (See my online lesson Pro Secrets: Buddy's Bag for more on this.) Chad and Flea again duo up in this segment for a real cooker called "Nobody Weird Like Me." Flea makes an important point that there are lots of drummer's who can play flashy and fast but lack the more important ability of grooving at a slow tempo. In this segment, Chad expands on Flea's previous advice. That is, a drummer needs to develop the ability to play simply sometimes and not try to fit chops in everywhere. Chad demonstrates this as he plays along to the tune "I Could Have Lied". Bass player Flea brings up another great point about the important role your emotions play in your ability to groove at any particular point in time. The final segments of the main video consist of Chad and Flea grooving on "My Lovely Man," Chad performing a solo, and Chad concluding with a tune best left unnamed in a PG rated review! As I mentioned earlier, this DVD option allows you to see and hear Chad playing along with nine Red Hot Chili Pepper tunes. Throughout the DVD the camera work is excellent and offers plenty of Footcam action to show you what Chad's bass foot is doing as well as views of what's happening on the rest of the kit. This segment increases the DVD's value as a practice tool. Red Hot Bloopers: Bloopers are always among my favorites on any DVD. Skinny Sweaty Man Performance: Excerpt of a live Red Hot Chili Peppers performance. Additional Product Reviews: Info on other Alfred Publishing products for DrumHeads. I have to agree that this DVD does live up to it's promise to entertain and educate. Where else can you pick up some good drumming tips and enjoy great RHCP music while being entertained by cosmic snake dancers, Tatoo Cams, and even flames shooting out of Chad's head! The only warning I would give is to parents who may not want younger ones exposed to some of the explicit language in the song lyrics. I particularly recommend this DVD to beginning and intermediate drummers and, although I feel the retail price of $39.95 is a bit on the high side (I guess someone has to pay for the rights to use all those RHCP tunes), you may be able to purchase it at a discount on the Web: Chad Smith Red Hot Rhythm Method DVD.